The stars were out in force. Fiorente, Green Moon, Mourayan. All Cup winners. Mourayan! One of my favourite horses, and I missed the $17.60 the place! I’m still in awe of Fiorente, who looked outstanding, but was too short at $1.20, so I passed on the race. Damn! I’m still spitting chips. But it was a good day. The omens were good. I was handed a free pen on striding into the course. How good is that! 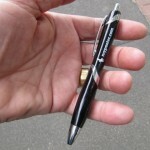 How many times do you see a desperate punter buy a pen for $3 when they get their book. How hopeless is that? Who goes to the races without being appropriately armed? I carry three pens. One as a reserve for the inevitable, and then a back-up for the reserve. Today I ended up with four pens. Only two bets for the day. Thermal Current at $1.90 and Pinwheel at $3.50. I was stuck in an agonisingly slow queue to back Pinwheel and in front of me was a little old lady, seventy plus, with a huge handbag and one minute to go. Here we go, I thought. A flexi quaddy. A lock out. But blow me down, she starts counting out the fifties and puts down $1000 on the nose of Moment Of Change. I’ll be damned! I got on with ten seconds left. Moment Of Change led from pillar to post, but Pinwheel held on for third. Polanski, who was over-aroused out the back, pulled up injured and was carted off to hospital in the horse ambulance. 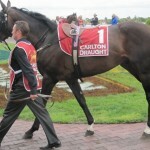 The best horse I saw all day was Earthquake. 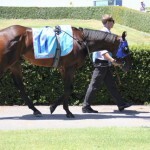 You will never see a better filly or a more relaxed horse. But I just watched it go around at $1.50. My strike rate of two out of three means that I’ll never get ahead if I back them at that price. And I saw a nice pony. 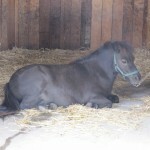 You never see a horse lying down on the job, but it’s a hard life being a stable pony, up at 4 am every morning! 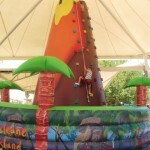 It’s a pity I’m not a kid any more. There was some great stuff to do today. 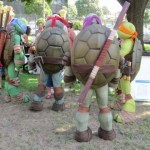 The Teenage Mutant Ninja Turtles emerged from their New York sewer to save us all from the 40 degree heat. 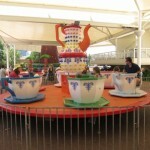 And there were tea cup rides for the littlies. And a volcano just waiting to be climbed. How cool is that? 11 am is a wee bit early to get to the track but I was keen to back Chase The Rainbow again. 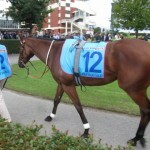 However the horse rocked up to the mounting yard with winkers and a tongue tie which are not part of the horse’s declared gear. The stewards ripped off the orange winkers, which was a relief to us all really. The colour is an assault on the senses. Rick Hore-Lacy argued with them and enquired as to whether they read the Herald Sun. Maybe the horse was listed in the paper as wearing the winkers? Whatever, I’m sure the horse is better off without them. 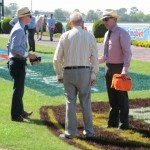 The tongue tie was whipped off at the barrier and the horse was replated after pulling a shoe. With all this drama I decided it best to leave it alone. Chase The Rainbow fought on magnificently to win by a nostril. Rick was fined $200. It all just shows that you don’t need orange winkers! Maldivian led them out for the main race, the Orr Stakes. Somone asked if I recognised the horse. 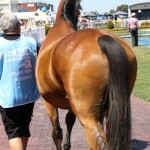 I confessed that I thought it was a pregnant mare! Maldivian is obviously enjoying life in the top paddock! Three bets for two placed horses with clean sheets, Marianne and Lumosty, and one loser, Francesco. I was a bit disappointed with Francesco as he looked so relaxed for a two-year-old colt, lobbing along with his head down, but he just ran out of puff over the last 100 metres. But two out of three is not too bad. It’s starting to get too hot. Even too hot for photography. But a good start to the hottest month, and my best time of year, with two placers from two bets – Mambo Lady for a nice $4.30 and Text’N Hurley for a measly $1.70. Roll on summer!